Shown L-R: Stephen Milley, National Sales Manager, Panasonic Professional Video Sales Channel; Derek Snyder, GC Pro Regional Manager; Rick Plushner, GC Pro Vice President; and Bill Brennan, Director of Category Sales, Panasonic System Networks Company of America. WESTLAKE VILLAGE, CA, July 16, 2012 — Guitar Center Professional (GC Pro), the outside sales division of Guitar Center that focuses on the needs of professional users, is pleased to announce that it has been appointed as an authorized dealer for Panasonic professional products. The announcement was made by Rick Plushner, GC Pro Vice President, and reflects GC Pro’s ongoing expansion and dedication to providing turnkey solutions. As dealers, GC Pro locations will offer Panasonic professional projectors, cameras, recorders and display products. 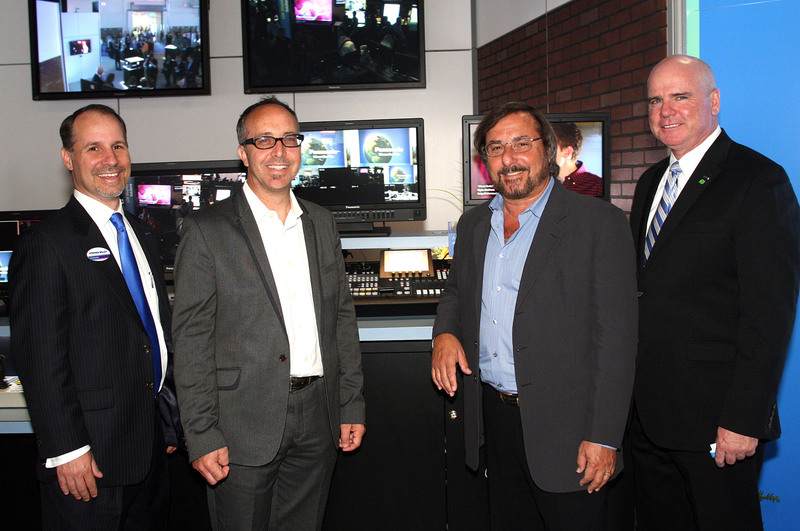 Photo Caption: Shown L-R: Stephen Milley, National Sales Manager, Panasonic Professional Video Sales Channel; Derek Snyder, GC Pro Regional Manager; Rick Plushner, GC Pro Vice President; and Bill Brennan, Director of Category Sales, Panasonic System Networks Company of America. Guitar Center is the leading United States retailer of guitars, amplifiers, percussion, keyboards and pro-audio and recording equipment. Our retail store subsidiary operates 230 Guitar Center stores across the United States. In addition, our Music & Arts division operates 101 retail stores specializing in band and orchestra instruments for sale and rental, serving teachers, band directors, college professors and students. We also are the largest direct response retailer of musical instruments and related products in the United States through our wholly owned subsidiary; Musician’s Friend, Inc., and its catalogs and owned or operated websites. More information on Guitar Center can be found by visiting the Company’s website at www.guitarcenter.com.